Less than six months after Samsung’s exploding phone debacle the company is at Mobile World Congress in Barcelona, Spain. MWC has sometimes been the venue where Samsung’s announces updates to its flagship Galaxy phone brand, but after the exploding phones, and with the company’s chief in the clink, a decision was clearly made to focus on something a little less dramatic than Samsung’s anticipated return to phones. So Samsung announced a new Windows 2-in-1 and an Android tablet instead. The Galaxy Book is Samsung’s new Windows 2-in-1 and it might just be the best-named product Samsung has done in a while. It’s certainly an improvement over the name of the laptop it replaces: last year’s Samsung Galaxy TabPro S. Like the TabPro S, the Book is a Surface-style Windows 10 device with detachable keyboard. This year the Book has been upgraded to a Kaby Lake processor and seen some noticeable improvements to the keyboard. It also now comes in 10-inch and 12-inch models. The TabPro S only came in a 12-inch model. There’s no word on pricing or availability, but TabPro S started at $900 when it premiered early last year. The 10-inch model of the Galaxy Book is expected to be cheaper than the 12-inch model. It also won’t support HDR playback, which Samsung claims the 12-inch version will. The Galaxy Book won’t be the only Samsung mobile device supporting HDR this year. Samsung’s also announced a new Android tablet, the Samsung Galaxy Tab S3. It’s a very nice looking piece of hardware with speakers tuned by AKG to allegedly improve sound, and an all glass front and back that are meant to bring it in line with the general Galaxy aesthetic (take note of that shiny design because we’ll probably revisit it when the Samsung Galaxy S8 is announced). The future of Samsung is very shiny. The tablet also plays back HDR content and, at least in the very controlled demo put on by Samsung, the HDR improvements are immediately visually arresting. Sunsets seemed to bloom on the sAMOLED display and all the things usually hidden in shadows were easily revealed. 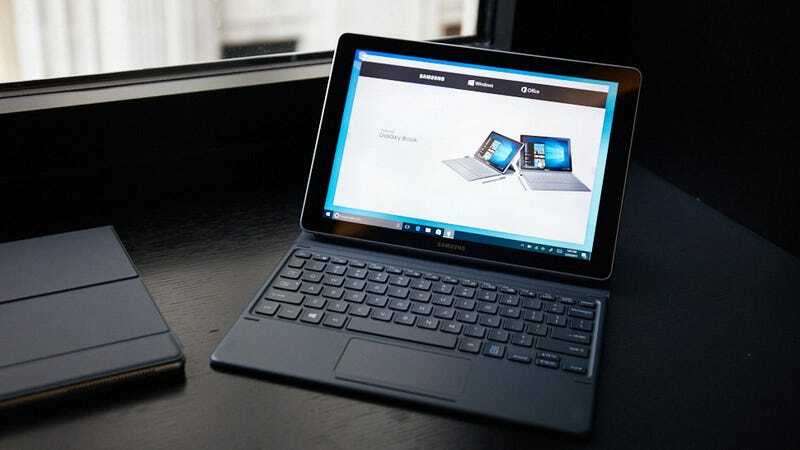 The tablet also has a new keyboard that looks like an iPad Pro keyboard, but is infinitely more pleasant to type on, and the pen included with the Galaxy Book is included with the Tab S3 as well. But all those bells and whistles don’t answer a big question looming over the Tab S3: who the hell is going to buy this tablet? While there’s a definite market for the Galaxy Book, the Tab S3 is entering the wasteland that the Android tablet market has become. Everyone else stopped making Android tablets because consumers simply weren’t buying them.